Every once in a while my wife and I feel the need to leave our quiet little town behind and escape for the weekend to…well…another quiet little town. This past weekend it was Lewiston, N.Y. Located about 8 miles north of Niagara Falls along the Niagara River, the Village of Lewiston turned out to be way cooler than its online presence would have you believe. (Sometimes Google Street View and a chamber of commerce site just don’t do a town justice.) When we cruised into town around 7 p.m. on Friday night, we were immediately taken by the charming, historic architecture along Lewiston’s tree-lined main thoroughfare, Center Street. –At least four café/bakeries (Orange Cat Coffee Company, Mangia Café and Bakery, DiCamillo Bakery, The Village Bake Shop). There may have been more. But we only had time to stuff our faces at these ones. –A rare books dealer – Bob’s Olde Books – whose owner, author Bob Giannetti, was particularly helpful and friendly, although obviously nervous (and understandably so) when I walked in with my 3.5-year-old son in tow. “This place is like a minefield for kids,” he said (hint, hint). Oh, if only he knew of the true destructive capabilities of The Animal. –A super-cool old stone building known as The Frontier House (c. 1824), which at one time served as a hotel/stagecoach stop for such notables writers James Fenimore Cooper and Charles Dickens; controversial U.S. Senator Henry Clay; and some other dude named John L. Sullivan I didn’t feel like Googling. According to historiclewiston.org, the last official use of the now vacant building was as “an historic McDonald’s Restaurant.” Only in America! 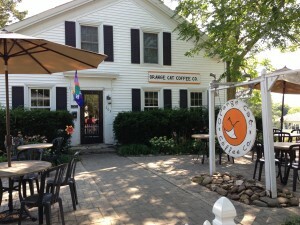 –Various eateries including Brickyard Pub and BBQ, Carmelo’s Restaurant, Apple Granny, etc. 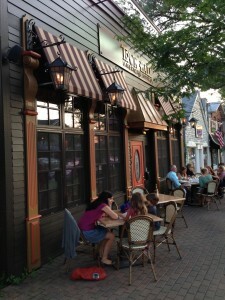 We ended up dining at Town Hall American Bistro on Friday night, basically because they had outdoor seating, which is always the safest option with two tired and famished offspring. Boogieface climbed a tree to help us find our way to the falls. Saturday, when we strolled around the village for a bit before heading off to Niagara Falls. Unfortunately, since our passports aren’t up-to-date, we couldn’t visit the Canadian side, which arguably offers the more impressive view of the falls. Plus, they have the casino and the wax museum, which really go hand-in-hand with scenic natural wonders. Here in America, however, we prefer to preserve the naturalness of our treasured natural sites. That’s why when you visit the falls on the American side it takes you several hours just to locate the falls, whose roar you can hear so you know that they have to be around here somewhere, for heaven’s sake, as you wander aimlessly around the labyrinth of tree-lined pathways that you hope will lead to the falls but which actually just lead you one of the hundred or so ice cream stands in the park. We spent about two hours walking to and from the falls and about 7 minutes actually looking at them. It really gives you a feeling of accomplishment when you finally make it back to your car, having only dropped $10.50 on some Dippin’ Dots and a chocolate-covered ice cream bar. Personally, I was just relieved that I was able to keep The Animal from jumping/falling into the rushing water. That evening we returned to Lewiston and dined at Casa Antica on their outdoor patio. This isn’t a food blog and I don’t like to review the places at which I eat. 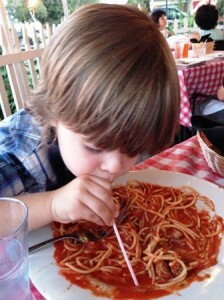 However, I will share that my son finished all of his skettis and meatballs and even slurped up the excess sauce with a straw. Although, that may just be because I forgot to feed him lunch before his nap. 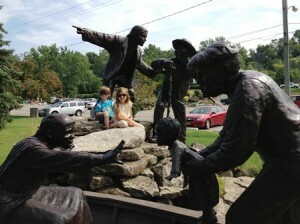 Before departing on Sunday, we took the kids to the end of town where Center Street end terminates at the Niagara River. What was once a busy port where up to 10,000 people would arrive and depart daily is now a tranquil riverside park/marina, where you can fish, walk along the boardwalk, or grab a bite to eat at The Silo restaurant, an historic eatery with an amazing view and an ice cream stand inside an old caboose . Freedom Crossing monument. Or a jungle gym. The riverside park is also the site of one of the final stops along the Underground Railroad, and they have a wonderful monument to honor this important place in U.S. history. 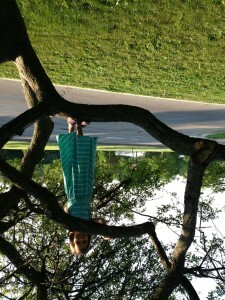 Of course our kids just thought it was another cool thing to climb on. But I guess the history lessons can wait. 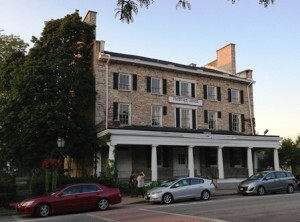 We had a wonderful, relaxing stay in the Village of Lewiston. I’d recommend it to anyone looking for a quaint, historic little town in which to unwind and spend some time doing nothing but stuffing their face and drinking way too much coffee and/or wine. 4 Responses to "Small-Town Adventures – Lewiston, N.Y."
We love Lewiston! We ate at the Brickyard BBQ & Pub there a few weeks ago for the second time this year. The kids thought it was super cool inside and loved the food. Next time, head up to Ft. Niagara-very cool place! I raised my children in Youngstown New York just north where Fort Niagara is just north of Lewiston. My children went to Lewiston School District. When my son moved to Beaver it was a reminder of the village feel that Lewiston and Youngstown offered. Glad you liked the village it was apart of my life for many years and I enjoyed it immensely. Hi Elizabeth! I agree. Beaver and Lewiston are very similar in feel: historic, beautiful homes, quiet, friendly. We’ll certainly be going back there soon. Thanks for reading!